With its prismatic form, clean lines and dramatic winter garden, the new headquarters for Repsol-YPF—one of the world’s top energy companies—is a dignified corporate symbol and a modern landmark for Buenos Aires. The tower is also the tallest office building in Argentina. The Torre YPF stands apart from the busy streets and avenues of Buenos Aires, its full height visible from all sides. Located on the edge of the stylish neighborhood of Puerto Madero and visible from the historic Plaza de Mayo, the tower is the easternmost structure before the open space of Costanera Sur (the Buenos Aires ecological reserve) and the broad waters of the Rio de la Plata. The tower’s form is composed of two volumes generated from the interlocking shapes of a triangle and a square, rotated 45-degrees from one another and extruded skyward. The result is two distinct towers pressed together in a single, unified composition. 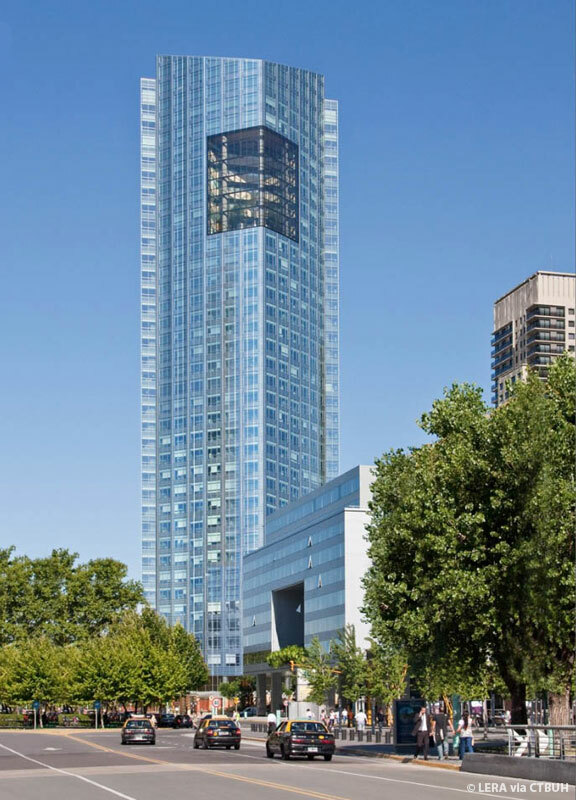 The floor plates of each tower press outward in a gentle curve, causing the glass-and-steel skin to appear stretched across the building’s surface and heightening its delicate sense of thinness. While the two interlocking towers share an aesthetic spirit, they are subtly differentiated. The triangular tower, reminiscent of a ship’s prow, tilts toward the river, while the square tower leans toward the city. The triangular tower is nearly all glass and has a lightly reflective finish and fine pattern of horizontal lines that accentuates its sense of volume. The square tower, on the other hand, has a more urban expression, with a grid of stainless steel panels surrounding square panels of glass. The tower’s most distinctive feature is its six-story winter garden, located in the corner of the square tower near, but not quite at, the top. The winter garden has an emblematic presence on the façade, like a logo or a sign. Several large trees occupy the space, and at night, lit from within and visible from afar, the winter garden is a symbol for clean energy and Buenos Aires’ natural setting.